"The acceleration of our investments in France for electric vehicles will increase the competitiveness and attractiveness of our French industrial sites. Within the framework of its Drive the Future strategic plan and with the Alliance, Groupe Renault is giving itself the means to maintain its leadership in the electric vehicle market and to continue to develop new sustainable mobility solutions for all". Renault previously announced that it plans to recruit 5,000 employees on permanent contracts in France between 2017 and 2019 and to spend 235 million euros on training over the same period. Focused on the future, Renault's plants are adapting to meet the demands of their customers and the new challenges of the automotive sector. 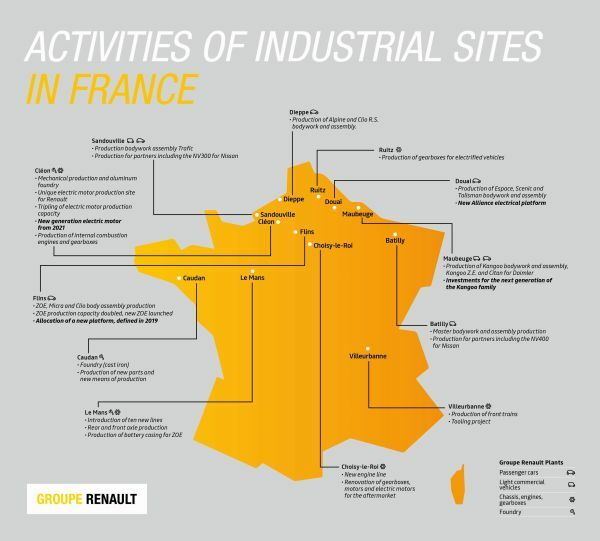 The Group intends to continue the modernisation and digitalisation of its French industrial network to ensure a high level of activity at its sites.